Bladderwrack is used as a tea, for broth, flavoring seafood and to extract in tinctures. Ours is OCIA Certified Organic and is also tested for heavy metal, chemical and microbiological contaminants. 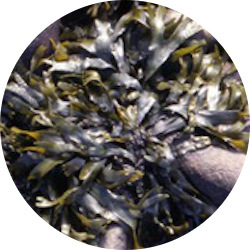 Bladderwrack is high in Vitamin C, Vitamin A, iodine, magnesium and other minerals. It has been used for many years as part of a weight loss regimen by many individuals by stimulating the thyroid. Like Kelp, Bladderwrack contains fucodian which is a polysaccharide that removes heavy metals and radiation from the body. And our Bladderwrack Leaves are sun-dried so they are a totally RAW living superfood!